Mary Alexandra Agner's poetry collection The Scientific Method begins with a sly, eponymous poem likening the scientific method to bras. The confrontational narrator concedes it's the reader's prerogative to discardeven burnthe offending item, but insists "the idea doesn't go away." By observing, hypothesizing, testing, the narrator says, we might devise a Scientific Bra for our empirical adventures, one that supports us, rather than binding or contorting. So long as we can easily remove it when convenient and stow it in our "little black bag," why sacrifice such a useful device? By assuming a female readership in her introductory poem, Agner creates a welcoming (and welcome) space unusual in science and science fiction texts. The twenty poems, half reprints, are arranged by subject in playfully titled sections: Rockhounds 101, Bio Lab, Fizzlers and Stinker, Bending Circuits, Stars and 'Scopes, and Research. Agner speaks as planets (Earth and Venus) and mermaids. She talks to moss, a satellite, and the ancient giraffe. But what I found most affecting were her odes to female pioneers of science. Agner invokes the likes of Florence Nightingale and Barbara McClintock in more reverential tones than Homer used to invoke the Muses, but her perception of these heroines is shrewd and seldom rose-colored. For example, it is not Nightingale's nursing career that Agner highlights in "After Math" but her contributions to statistics. Post-Crimean War, Nightingale designed infographics ("coxcomb wedges for the dead") to advocate for better sanitation and hygiene in hospitals. Nightingale's visual perspicacity could benefit our generation, as well, writes Agner: "we who are inured to what remains / after explosives and machine-gun fire." In "Jump the Chromosome" Agner begs from cytogeneticist McClintock, "your thirty years of patience / waiting for the world to listen to your truths." Thirty years' patience might not be enough: In "Ros' Final Hike," Agner acknowledges that some pioneers die waiting for proper recognition. Of Rosalind Franklin, whose contributions to the model of DNA were denied long after her death, Agner writes, "The dwarves of history don't come / to carry back her casket into canon." Not all the pioneers profiled in The Scientific Method come off sympathetically. "Grace Hopper Sneers at the Feminist Reporter" is an aptly titled portrait of the career Navy woman who popularized the term debugging. Hopper's bootstrapping philosophy is all the more unpleasant when juxtaposed with "The Computers' Drinking Song" (the computers in question being the so-called ENIAC girls). Agner may expose the clay feet of her idols, but her honesty only stokes reader interest. I found myself researching Agner's various subjects and re-examining what I thought I knew about them. I imagine most other readers will do the same. The collection's only weakness was the Stars and 'Scopes section. Two of the three poems were conceptually ambitious, but I found their execution unsatisfying. 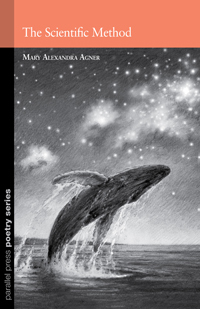 The conceit of "Duet for Leviathan and Glass," likening whale to telescope, struck me as absurd, and the poem, though lush in language and setting, never made the comparison believable to me. "Middle Night," an interpolation of Sappho, juxtaposes the Pleiades' sensual companionship with the stargazer's aching solitude. I see the appeal of claiming Sappho for this project, but Agner's impressionistic snapshot fleshes out Sappho's poem without adding much else. Tucked between "Duet" and "Middle Night" is "Ebb," about the astronomer Caroline Herschel after her brother's death. "Ebb" takes fewer risks than the other poems in this section, but it also delivers a more satisfying narrative with emotional resonance. The collection culminates with "What Light I Can Conjure," a meditation on self-awareness and death. Again recalling epic traditions, Agner describes being escorted on a Dante-esque katabasis, not by a mentor poet, but by a fellow Lady of Science, Mary Fairfax Somerville. The series of rhyming envelope quintets is perfectly suited to the "Escher self-portrait" of the poet descending to the underworld; the unrelenting structure and repetition heighten the surrealism when the protagonist meets her equal-and-opposite doppelganger. This twin forces the poet to consider (to quote an earlier poem in the book), "How does the changing pressure / pressure you to change?" In a fitting denouement, Agner's sonnet "Perception Test" challenges the common perception of science: Does the scientific eye vanquish all sense of mystery from the natural world? Or does it reveal yet more mysteries to be explored? Agner needn't answer. The Scientific Method makes her perspective crystal clear to the reader. Lisa M. Bradley's poetry has appeared most recently in Fantastique Unfettered, Bull Spec, and Strange Horizons. More work is forthcoming in Cicada, GUD, and Polu Texni. Lisa loves movies, books, puzzles, calacas, gothic country, insubordination, art in unexpected places, thresholds, taboos, and tofu--as you can see at cafenowhere.livejournal.com.